Reloading Your Own Shotgun Shells: The Video! As a former teacher, I love to promote kids’ efforts. This was a speech project of a high school senior. After watching this video, I asked MDH* to give me all his old shotgun shells and his reloader. I told him that I now felt competent to reload his shells. Richard collapsed in a fit of hysteria. He was excited — just not about letting me prepare the shells he would use. The Video that Taught Me All I Know About Shotgun Reloading! * MDH = My Deer Husband, (also known as) He Who Likes to be Obeyed … but Rarely Is! on May 5, 2010 at 7:00 am Comments Off on Reloading Your Own Shotgun Shells: The Video! Talkin’ Turkey: Density Patterns & Your Gun! Last time, I didn’t get around to density patterns, chokes and other excitement. Why Bother With Density Patterns? Besides getting the shot to evenly scatter on a target, there’s an issue of figuring the percentage of shot that hits inside the circle. This is another way of making sure your gun will take down a turkey in one shot. This huge bird has a very small area in the “kill zone” — a tiny brain and the cervical vertebra (spine). And gobblers won’t wait around for you to reload! If you do not kill the bird outright, he will run away and die elsewhere! This is bad for a couple of reasons. I hate to see any animal suffer and it is usually a huge expenditure of time to chase a wounded turkey. I might also mention that it is usually wasted time; trying to find a wounded animal/bird is hard work and usually futile. You need to know how many pellets are in each shell you have fired. The graph below will help. Look on the label of the ammo box for the number of ounces of pellets in each shell. Let’s use one of MDH’s * turkey load shot: Remington Mohawk Long Range #4 Shot (1.25 ozs.). Looking at the scale above, we know that #4 shot has 135 pellets/oz. 135 x 1.25 ozs. = about 169 pellets. Measuring a percentage is a good measure for comparisons. However, a dense, even pattern is more important — when you take a bead on a turkey! I know, I know: I promised the low-down on the Eastern Wild Turkey. I got bored after the other 4. I’ll get back to the Eastern soon. Disclaimer: I’m the first to admit I don’t know all there is to know about hunting. I offer this info to Newbies — maybe I know a bit more than they do. As with most activities, there’s more than one way to do things. This is a way that works for me. You may know a better, faster, less expensive way — and that’s great. Share your abilities! on April 23, 2010 at 5:04 am Comments Off on Talkin’ Turkey: Density Patterns & Your Gun! * Please read the Disclaimer below! Make sure any weapon is unloaded before starting the cleaning process. Do you have to clean a gun each-and-every time you use it? Perhaps. It depends on how much gunk remains in the gun after shooting and how fastidious you are. It is easier to remove the crud in your gun before it ‘sets up like concrete!’ Poorly cleaned or dirty firearms are not reliable. While hunting, we never know who or what we will meet. If you come upon a rattlesnake – about to strike, or a mountain lion – ready to leap towards you, this is no time to have a gun that binds up or refuses to feed or eject a spent casing. to have a weapon ready when you are! Everything else is window dressing! Sporting goods stores offer a variety of gun cleaning kits. If you are new to the task, selecting a good cleaning kit may seem like a daunting task. Most kits have far more “stuff” than you need. Generally speaking, any cleaning kit that has “premium” in its title is probably over-kill. After reading this summary, you will have a very good idea of the number of products you really need to complete the task of cleaning a gun. I will describe one way to clean a weapon … it is not the only way. If you have learned the process using a different method … fine! We have one goal: We want an absolutely reliable gun. How we reach that goal is less important than being sure that we do reach that goal! Disclaimer: The author of this information has made a good-faith effort to give accurate directions and advice. However, she makes no guarantees, express or implied, or assumes any legal liability or responsibility for the accuracy, completeness or usefulness of any information offered here. Weapons need regular cleaning and maintenance. Hunters taking the time to keep to keep their weapons free of dirt and well-oiled have fewer problems. During the life of a weapon, things happen that we don’t expect. Here are three problems hunters can have … and some possible solutions. For safety’s sake, it is important to keep the gun aimed downrange for at least one minute. As children, we would laugh at Porky Pig and his antics while hunting. He never seemed to learn that it wasn’t a healthy move to turn the gun barrel around towards his head — while trying to figure out why the weapon didn’t fire. Of course, about the time he got the barrel to his eye, the gun suddenly fired, leaving Porky with a fried face. We laugh because we know what a dumb thing Porky is doing. However, it is no laughing matter when a gun does not discharge. After waiting a decent interval, unload the gun and look for an obvious obstruction or other problem. If the problem is not obvious, or cannot be easily fixed, it is time to consult a gunsmith. It is possible to lodge something in the end of your gun by tripping while holding your gun — and plowing your barrel into the ground. It is important to unload your weapon and take it apart, while keeping the muzzle facing a safe direction. Clean the gun completely. Never try to remove an obstruction by shooting it out! While tramping out to your duck blind, it is possible for water, grit or mud to splash up into your barrel. Before loading your gun, be sure that you have checked the gun’s barrel. MDH * takes along a coil-able wire (the length of the barrel) to remove debris. After he’s sure there nothing ‘foreign’ in the gun barrel, he loads it with ammo. This is Veteran’s Day — Let Us Give Thanks! Before starting today’s article, I’d like to thank all veterans for the sacrifices they have made for us! I cannot fathom the grief of the mothers and fathers who lost their adult sons and daughters in the tragedy at Fort Hood! Just as they were thinking how great it was to have their children safe in the US, they had to face such unspeakable and shocking grief. 'Thank You!' to each Member of our Army! America doesn’t just have heroes on foreign soil! Fort Hood reminds us that heroes are everywhere! If you see a serviceman or woman today — in a restaurant, a coffee shop or convenience store –– how about picking up the tab for their meal, coffee, newspaper or coke? YOU will feel better for having done it! Before you shoot, be sure of your target and what lies beyond it. Have your weapon pointed in a safe direction at all times. Every gun is loaded UNTIL you check it yourself! Keep your finger off the trigger until you are ready to shoot! Shooting from a vehicle is against the law (in most states) and unethical! 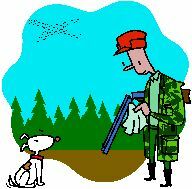 on November 11, 2009 at 12:03 am Comments Off on Hunting Accidents are Preventable! The following is a list of the recommended ways to carry your weapon (in these cases a long gun, such as rifle or shotgun) — while hunting. Your gun is carried in a relaxed position on your shoulder. It’s best to use this position when other hunters are in front or walking by your side. Carrying a Weapon in the Crook of Your Elbow! This position is excellent when others are walking behind you or on your opposite side. (This looks as if you are carrying a baby in one arm.) This position is valuable when others are in front and in back of you. Your gun can also be cradled in this way when someone is walking on your side — opposite of the weapon. However, never use this position if others are walking on both sides of you. This is a good way to carry your gun when others are in front or behind you. This position should never be used when other hunters are walking on both sides of you, but may be used when the gun is pointed away from a person walking on your opposite side. (The gun is carried via a strap, on your back shoulder.) This is a great way to carry your weapon while hiking to-and-from your hunting area. Keep the barrel pointed up or even pointed down. (The weapon is carried with your hand on the for-end with the muzzle pointing forward.) This position is a good way to carry a weapon when others are behind you and/or walking by your side(s). 1) When climbing, always unload your weapon and use the sling carry! 2) When you need to lift your gun to your position in a tree, tripod or elevated stand, unload the weapon and use a “hand line.” The gun is lifted by cord. rope, etc., up to your position. Always remember to make your weapon safe by sight, with such things as opening the bolt (on bolt action rifles), opening the lever (on lever action rifles), or by breaking open your double or single barrel shotgun. Do NOT depend on the safety doing its job. Old timers can tell of many near misses or fatal accidents caused by “empty” guns. Remember that “safety” is the most important thing you take with you on any hunting expedition! Getting Your Gun Ready for Hunting Season! A) Newbies should have an experienced person show them how to use and maintain their weapon. B) Before sighting in your gun, you should be able to assemble, clean and take your gun apart with confidence. C) Figure Out Which is Your Dominant Eye! (1) Decide on an object that is about 10 feet ( ~ 3 meters) away from you. (2) Extend your arms in front of your body. (3) Overlap your hands so a small triangle forms between your thumbs and index fingers. (4) Look through the triangle with both eyes open – at that object. (5) Focus your eyes on the object you can see through the triangle. (6) Now start to bring the triangle closer to your eyes — while keeping the object in sight all the time. (7) To keep the object in sight, the triangle will move toward your dominant eye. MDH* prefers this way to determine the dominant eye. Do as instructed for steps 1 -5. Then …. (6a) Close your left eye and look with your right eye through the triangle. (7a) Now close your right eye and look with your left eye through the triangle. (8a) With which eye do you see the object in the same position? That is your dominant eye. The other eye requires you to move your hands, in order to continue to see the object. Just a hint: Most right-handed folks are also right eyed. I’m left-handed and also left eyed. However, this is NOT written in stone! D) Always keep your weapon pointed in a safe direction!